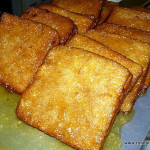 Every Easter, known as Semana Santa in Spain, local bakeries and patisseries will make up special Easter desserts, and in Ronda the pick of the bunch is called Torrijas, a sweet treat made with bread as the base, filled with custard, and drowned in honey or sugar and served on a plate to be eaten with a knife and fork. Of course as is typical of the Spanish, every region will have their own variation, so the recipe I’m going to share with you may not be exactly how your Spanish friends would make it, so be careful you don’t offend them by saying this recipe is the best, instead nod knowingly when they tell you what is missing, or how they’d make it, and then when their back is turned choose the recipe you prefer. 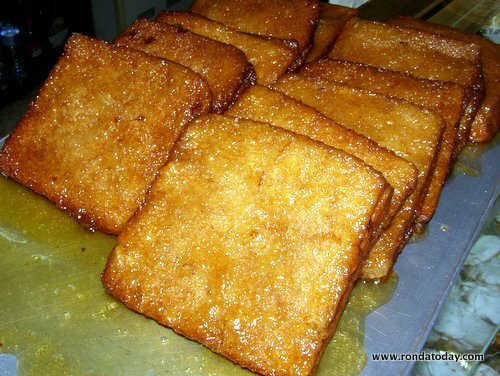 Torrijas (Br Eng: Bread Pudding – Am Eng: French Toast) originated right here in Andalucia and is eaten during the 40 days of lent, originally prepared by nuns in their convents that they would sell or keep for their own after work treats. 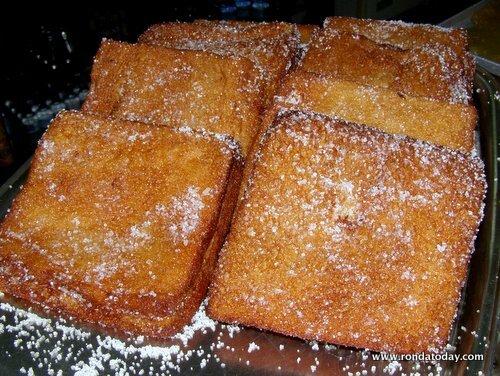 Back in the 15th century when the recipe was first created bread would go stale quickly, and torrijas came about as a means to reusing day old bread, which for many is the only food permitted to be eaten during lent. First, prepare the custard and allow it to cool, you might want to use a higher ratio of custard powder than you’d normally when making custard. We want it be custard cream for spreading, rather than for pouring. Add the milk and anise together in a flat bowl, then soak the bread in it. If you don’t have day old bread you can lightly toast the bread so that it absorbs the milk. 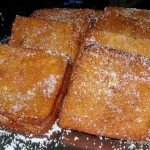 Spread some of the custard between two slices of the bread, and then dip in a bowl with the eggs beaten. Fry the bread/custard sandwiches over a hot even temperature until golden brown. 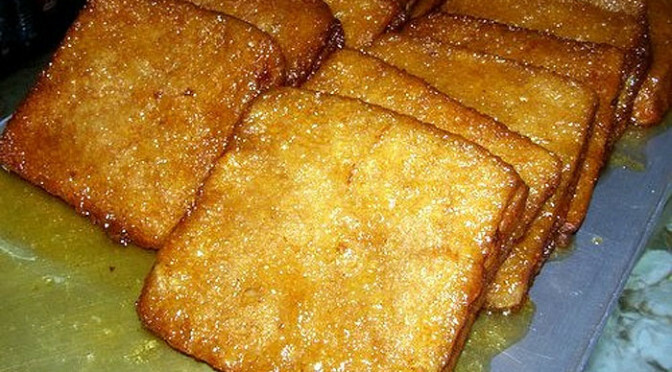 There are two choices for finishing the recipe, either heavily sprinkle with sugar and cinnamon mixed together making sure to cover both sides, or pour heated honey (mixed with water in a 50/50 mixture) over the torrijas. This recipe makes a spectacular sweet treat for breakfast with a cup of hot strong coffee, or leave to cool and serve as a dessert with pieces of fruit on top. Previous PostLucho and Leticia Perform in Ronda | Ronda, the City of Dreams in Andalusia, Southern SpainNext PostTHREE FORMS OF TOURISM UNDER THE SAME PHILOSOPHY LIKE SLOW TOURISM.